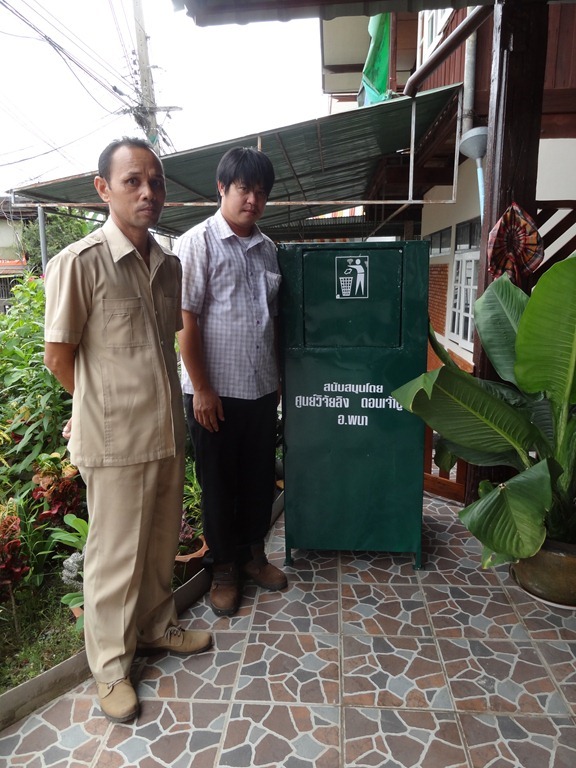 Phana Monkey Project (through Don Chao Poo Research Centre) is providing waste bins to be placed in Don Chao Poo Forest, Phana, as part of the efforts to make the forest a cleaner and healthier environment for monkeys and humans alike. Plastic bags are the main component of litter in the forest and both humans and monkeys must share the blame for this. Humans provide food for the monkeys and this is often in plastic bags. Some of the bags are dropped by humans, others are snatched by monkeys. 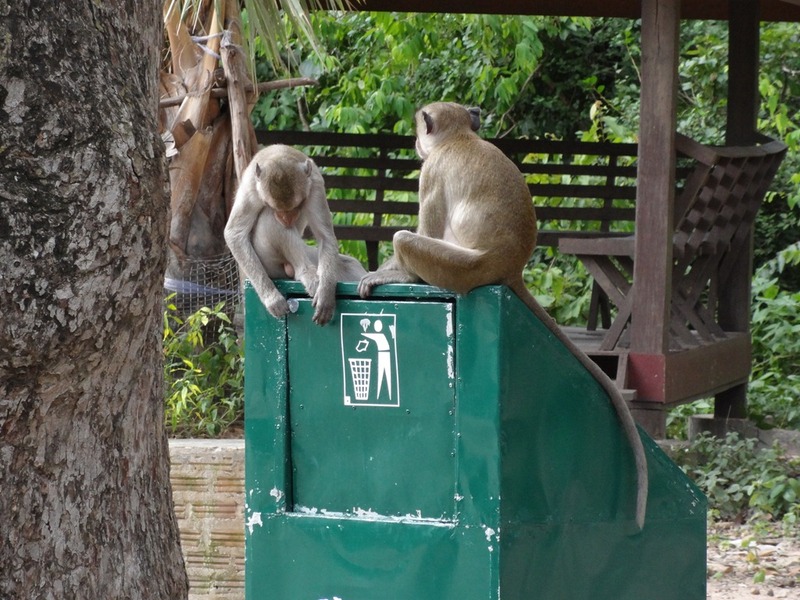 Putting the bags into bins is ineffectual if the monkeys are able to take them out again. Young male monkeys in particular like to play with bags and anything else they can get their hands on. 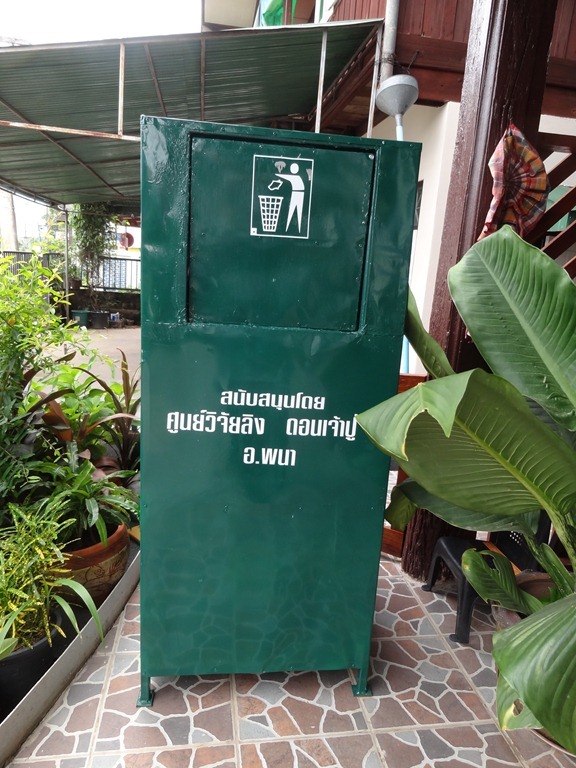 Phana District Hospital has had to confront the issue of monkeys raiding their rubbish bins and of course this is particularly important for a hospital which has some waste material that is potentially dangerous. So we turned to the hospital for help and the engineers there came up with this prototype for us and delivered it to the Research Centre. We placed it just inside the main entrance to the forest, where most of the litter accumulates. It attracted immediate attention from several adult male monkeys. 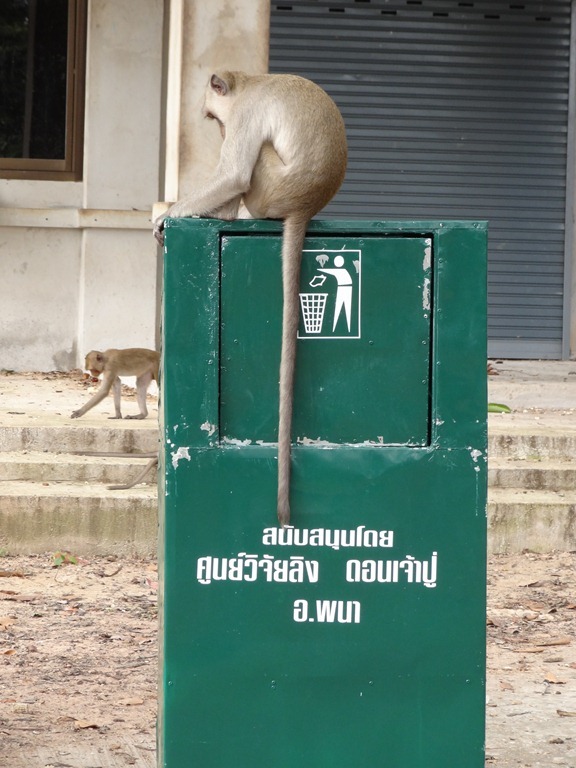 Only male monkeys were at all interested in the bin and the second only climbed onto the bin when he was sure the first was no longer interested. The third monkey you see climbing up to join the second one was almost certainly a sibling and trusted by the older monkey. Several younger monkeys were chased away. We have since re-located the bin next to the tree and made it much harder to shake. These and other monkeys shake branches and anything else as a sign of ownership amd dominance, but in the case of waste bins it often results in them tipping over and emptying out the contents. This bin would only tip backwards from such shaking as you see here, so by placing it close to a tree we have hopefully prevented that happening. Back to the drawing board, possibly. 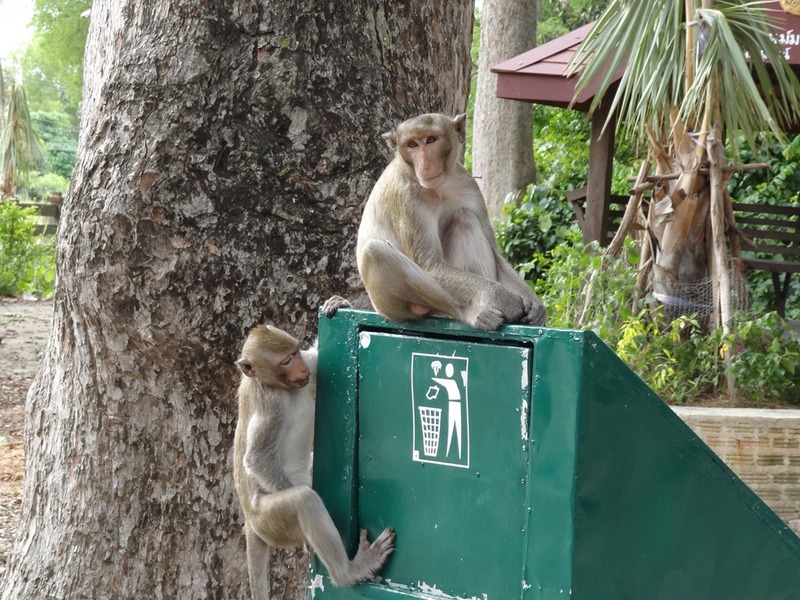 This entry was posted in Litter, Litterbins, Dustbins, Long-tailed Macaques, Macaca Fascicularis, Macaques, monkey forest, Monkeys and tagged Long-tailed Macaques, macaque images, monkey forest, Thai monkeys, Thailand. Bookmark the permalink.